In early 1865 the USS Harvest Moon, a 193-foot, 5-gun side-wheel steamer, was the flagship of Adm. John A. Dahlgren of the South Atlantic Blockading Squadron, U.S. Navy. It arrived off Georgetown and anchored nearby on February 26th. Confederate Capt. 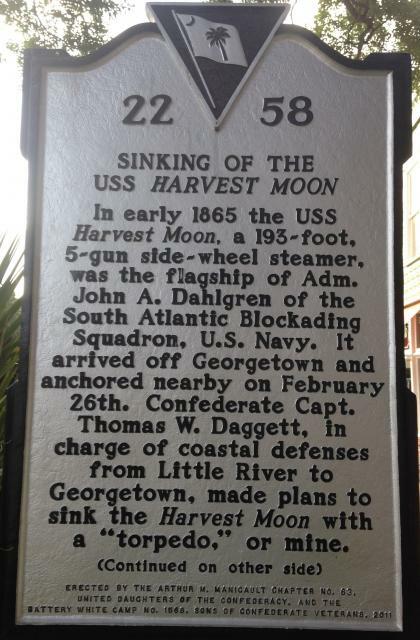 Thomas W. Daggett, in charge of coastal defenses from Little River to Georgetown, made plans to sink the Harvest Moon with a "torpedo," or mine. Daggett, working on the 2nd floor of S.W. 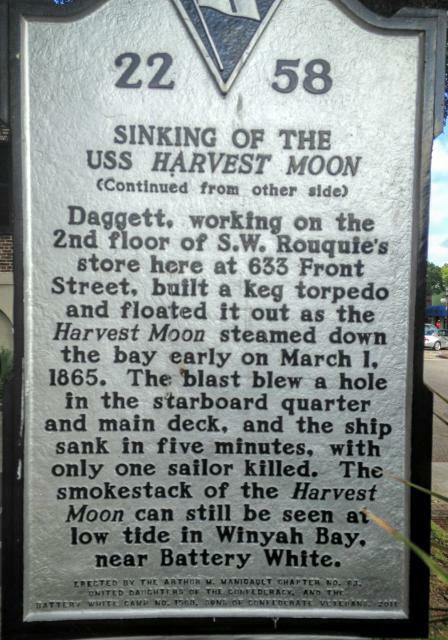 Rouquie's store here at 633 Front Street, built a keg torpedo and floated it out as the Harvest Moon steamed down the bay early on March 1, 1865. The blast blew a hole in the starboard quarter and main deck, and the ship sank in five minutes, with only one sailor killed. The smokestack of the Harvest Moon can still be seen at low tide in Winyah Bay, near Battery White. The smokestack of the Harvest Moon can still be seen at low tide in Winyah Bay. The stack is on the east side of the bay in shallow water across from navigation buoy #26. This is a shallow area with depths as low as 3 feet at MLWL. US-17 to St. James St. then right onto Front St. Marker is located on left at the clock tower. Two-lane city street with diagonal parking on both sides. This marker can also be identified by its HM code. You can use the hashtag #HMWKY in tweets, and any other place where you might refer to this marker, including when searching on this site.